Read the latest news from Northwestern University Feinberg School of Medicine’s Scleroderma team. The links below take you to articles where you can learn more about our faculty’s latest achievements, awards, and honors. Dr. Varga has been recognized by Chicago Magazine as one of the Top Doctors in 2019.
his seminal contributions to scleroderma research. The hallmark of scleroderma is unchecked scar formation (called fibrosis) in the skin, lungs, heart and other organs. The scar is made up of large insoluble proteins such as tenascin-C. Buildup of tenascin-C in the skin leads to stiff and rigid skin, while in the lungs it leads to shortness of breath. Despite its serious impact, the cause of scar formation in scleroderma remains enigmatic, and there are no effective treatments. This is what motivated Swati Bhattacharyya PhD, John Varga MD and Hubert Ying PhD and their multi-disciplinary research team from Northwestern Medicine and University of Colorado to seek the cause of unresolving fibrosis in scleroderma, and to find ways to dampen the process. A new study, published in the July 2018 issue of the Journal of Clinical Investigation Insight, demonstrates that the scar tissue itself serves as the signal to further scar formation. Moreover, the authors developed a novel compound that binds to a cellular receptor called TLR4 and selectively prevents its signaling. Importantly, blocking TLR4 using the novel compound leads to resolution of fibrosis in various mouse models of disease. This ground-breaking study is the first to indicate that in individuals with scleroderma, the scar tissue itself causes further increase in fibrosis, while blocking the process hastens scar resolution. This approach, while still experimental, was highly effective in reducing fibrosis in the mouse; and might ultimately lead to novel treatments in scleroderma patients with active fibrosis. The research team is now focusing on developing improved inhibitors that are safe and effective; and findings precise markers to identify which scleroderma patients might best respond to such novel treatments. This “precision medicine” approach would maximize the efficacy and benefit of the TLR4 inhibitor treatment while minimizing untoward side effects. Comprised of the work of international experts, including editor and co-author Dr. John Varga and co-authors Drs. 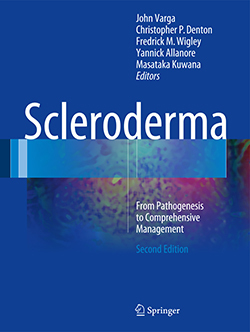 Monique Hinchcliff and Sanjiv Shah, this second edition of Scleroderma builds upon the approach in the first edition to provide integrated synthesis of current concepts of pathogenesis and modern approaches to management of systemic sclerosis (scleroderma). The new edition includes extensive material based on new and major developments in the field. Scleroderma: From Pathogenesis to Comprehensive Management serves as an essential resource for all health care professionals involved in the care of scleroderma patients. The Northwestern Scleroderma Program Team, led by Dr. John Varga, participated in the Scleroderma Foundation Greater Chicago Chapter's 13th Annual Stepping Out to Cure Scleroderma Walk in Highland Park on Sunday, June 29th. We were proud to support our patients and contribute to finding a cure for scleroderma. 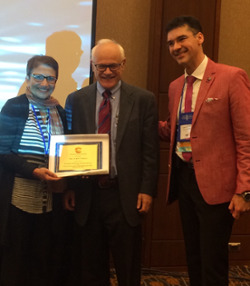 Dr. Varga has been recognized as a 2018 Master of the American College of Rheumatology (ACR). This honor is bestowed upon members who have made significant contributions to both the ACR and the field of rheumatology.